SUBSCRIBE to get every episode automatically via iTunes, Stitcher or Podbean. Strength & Speed owner, CTG Pro Team Athlete and Hammer Nutrition sponsored athlete Evan Perperis. For full bio click here. Click here for 2018 episodes (38-75) and here for 2017 episodes (1-37). Ep 86: Military veteran and hybrid Athlete Billy Richards has a interesting background in fitness and seems to live by the motto that "more is better". In 2019, Billy is attempting to set a world record for most 100 milers completed in a year. As of this recording he was at 9, now he's at 11. Evan and Billy talk mental strategies, training background, injury prevention and more in this episode. Ep 85: Former professional Mixed Martial Arts (MMA) fighter, Casey Johnson, joins Evan for this episode of the podcast to talk about MMA and OCR. The two talk training, weekly schedules, talk tips for new athletes entering OCR, the importance of mindset, differences between major series and finding flow. Ep 84: Elite contender from World's Toughest Mudder (WTM) Kelly Williams joins Evan for this week's podcast to talk about two serious OCR related injuries she sustained in the last two years including breaking her foot on mile 10 (of 50) at WTM. Kelly used her background as Board Certified Sports Medicine Physical Therapist to bounce back fast and won Bonefrog Talladega last weekend. Finally, Kelly and Evan talk Strength & Speed Development Team, changes to entrance and Evan announces his new book from Mud Run Guide. Ep 83: 2018 North American OCR Championship (NORAM) 3k 60+ Champion and creator of Indian Mud Run, Hubie Cushman joins Evan to talk about his Indian Mud Run event. The event has developed a strong following across the USA and is best known from its floating walls obstacles, which can be seen at NORAM and City Challenge. After talking about OCR, the topic dives into the Arnold Classic, where Hubie worked with Rogue to develop "The Wheel of Pain". This recreation from the movie "Conan The Barbarian" tested Strongman athletes at the largest sports festival in the world. Ep 82: OCRmill 24 is discussed, a charity fundraiser for Folds of Honor, in which Evan ran 24 hours of treadmill OCR at Conquer Fitness in Tulsa, OK. One mile run on a treadmill followed by four obstacles repeated for 24 hours. For the first half of the episode CTG Pro Lisa Nondorf joins Evan to talk her relay experience at Hybrid Athletic Club. 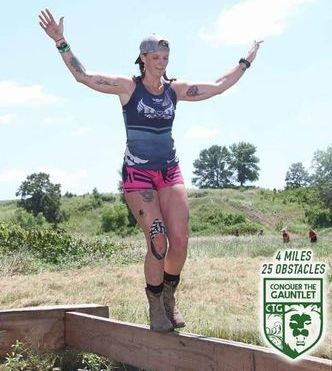 In the second half of the episode ultra-runner Helene Dumais joins Evan to talk about their 200+ mile treadmill relay at Otherworld OCR in Frederick, MD. Plus a special shout out to Squirrel's Nut Butter and a preview of Platinum Rig's new 24 hour relay. Ep 81: Savage Race build crew and competitive OCR athlete Lee Stowell joins Evan and Brenna for this fun filled episode. Lee talks Savage Race's new obstacles, what its like to work behind the scenes, he talks about Frontline OCR (OCR with a weight vest) and recounts stories from his time at BattleFrog. Included in this is the time Lee had to sub in for OCR legend Ryan Atkins on ESPN (no big deal). The episode ends with stories about poop including Evan having to pull security on a steamer in the Georgia woods. Ep 80: Brenna Calvert and Evan Perperis return from their trip to Hannibal Race Kuwait. Listen to hear a race recap, the cultural differences of international OCR and what it was like to travel across the world to race. Plus, they share how they manage to get their oversized checks home and some of their sightseeing in Kuwait. Ep 79: Steve Mola joins Evan on this podcast to talk about full contact armored combat. Think if LARPing had a baby with Mixed Martial Arts, it would probably look something like this. Steve talks training, lessons learned that can be applied to other sports and more in this unique episode. Ep 78: Evan and Brenna talk Hannibal Race Kuwait in this preview episode. Evan shares some unique and sometimes confusing experiences he had while living in downtown Kuwait City a couple of years ago and talks cultural differences. Then Brenna and Evan talk 2019 CTG Pro Team sponsors highlighting some of the great opportunities that people will have available in 2019. Ep 77: After great success working with Brenna Calvert and her off season preparation Luc Labonte joins Evan and Brenna for a podcast to answer listener questions. The listener questions were posted back in mid-December. Let us know if you enjoy this nutrition focused episode and we will do another one in a couple of months. Ep 76: 888k finisher and 2014 2nd place Killington Ultra-Beast finisher Helene Dumais joins Evan for a podcast recorded from Otherworld OCR in Frederick, Maryland. Helene a CrossFit Level II certified coach, accomplished ultra-runner and OCR gym manager discusses her training, future plans and what she changed to finish one of the longest endurance runs in the world.